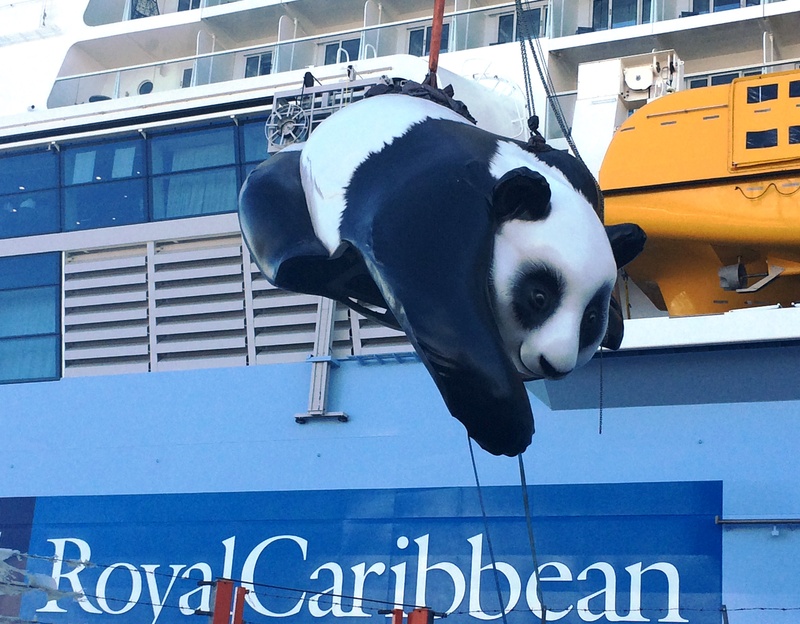 As cruise ship terminal operators loading and discharging baggage for thousands of passengers, Pathfinder’s sister company Southampton Cargo Handling (SCH) need to be flexible, but managing the loading of a five-tonne model of a giant panda and her baby onto Royal Caribbean International’s newest ship, Ovation of the Seas in Southampton demanded a special approach. Installing large models of animals at the stern of their ships has become something of a tradition for Royal Caribbean International (RCI) on its Quantum Class ships and, with Ovation of the Seas set to be based in China from June 2016, the choice of animal was obvious. After being transported from the Continent, the panda installation was carefully lifted some 150 feet to the top deck of the ship by a giant mobile crane. The operation was organised by SCH, who provide stevedoring services for all RCI ships calling in the port. SCH is also responsible for handling passenger baggage, ship’s stores and mooring Ovation of the Seas as she sails on a series of short cruises from Southampton over the next few weeks before heading to China early next month, where she will offer cruises in the Far East and Australasia. Built in Papenburg, Germany, Ovation of the Seas can cater for more than 4,000 passengers and is the third of RCI’s Quantum Class ships. Following the departure of Ovation of the Seas, SCH will be busy handling a full season of RCI calls in Southampton, including a maiden call by the extraordinary Harmony of the Seas,the largest cruise ship in the world at 227,000 tonnes. She is due to arrive in Southampton next month.